What if that relaxed feeling you get while on vacation never had to end? We are proud to present this fantastic opportunity to own your own piece of paradise in beautiful Redondo Beach. Dazzling sunsets, sparkling ocean views, boats passing by your window and those cool ocean breezes….Just a few features of daily life from this beautifully updated end unit 2 bedroom condo. Features include remodeled kitchen with granite counters, stainless steel appliances, recessed lights, new windows, updated baths and more. The beautiful complex offers 2 resort style pools, state of the art fitness center, on site market, BBQ areas and all within walking distance of the pier,shops, dining, King Harbor, bike path and world famous Redondo Beach. Live the true vacation lifestyle on the oceanfront street of the Esplanade in beautiful South Redondo Beach. Many of the buildings sit oceanfront and offer spectacular ocean and beach views and offer the epitome of Southern California beach living. Click here to view the current Esplande ocean front and ocean views for sale. Complexes such as the Sand Castle, San Simeon, Ocean Plaza and more offer the best in beachfront living in the South Bay and may be more affordable than you think. If you’ve dreamed of living life like you’re on vacation, this may be your opportunity. This beautifully remodeled condo in Redondo Beach offers vacation type living at it’s finest. 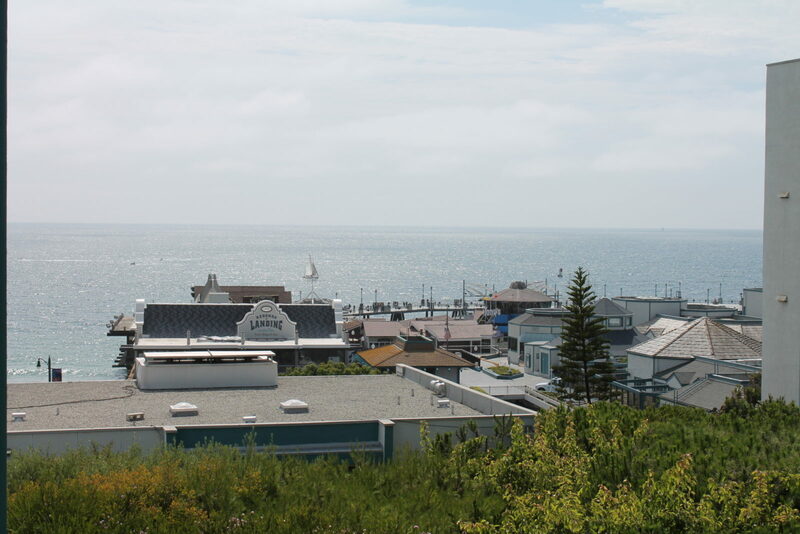 Enjoy ocean, harbor and Redondo pier views within walking distance to restaurants, shops and the beach. Contact Keith Kyle with South Bay Brokers for more information on this upcoming listing. 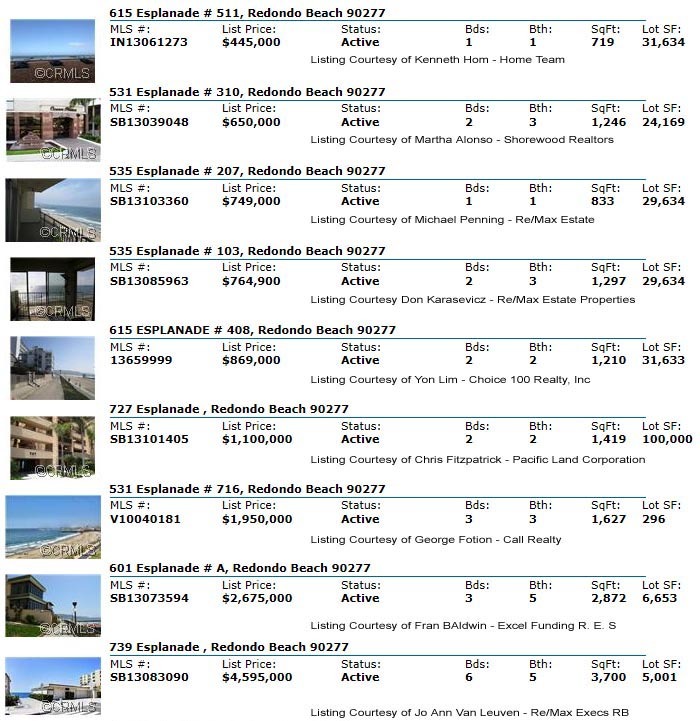 With inventory finally seeming to be on the rise, there are a number of oceanfront condos for sale on the Esplanade of Redondo Beach. Due to zoning allowing for large condo complexes, the various ocean front condos of the Esplanade are the most affordable way of living the ideal coastal lifestyle. Charming streets, big ocean views, a quaint downtown shopping area, and proximity to the beach…..just a few of the many wonderful features of the area known as the Hollywood Riviera. Although technically part of Torrance, the Hollywood Riviera has a Redondo Beach zip code and “beach” certainly belongs in the name with fantastic ocean views and just a short distance to some pristine Southern California beaches. Some of what makes this area unique is that the city has tried to protect the ocean views by making it more difficult to build up or out, due to “hillside overlay” restrictions….the result is a neighborhood in which the homes actually fit on the lot (a rarity in the South Bay) with smaller, often one level, homes with large yards and the feeling of space. The area spreads from the bluff top, ocean front homes of Paseo De La Playa, fairly far inland so prices vary considerably. Smaller beach cottages further from the beach can be occasionally found in the high $600K range while the most recent oceanfront home is in escrow near $4.2M. 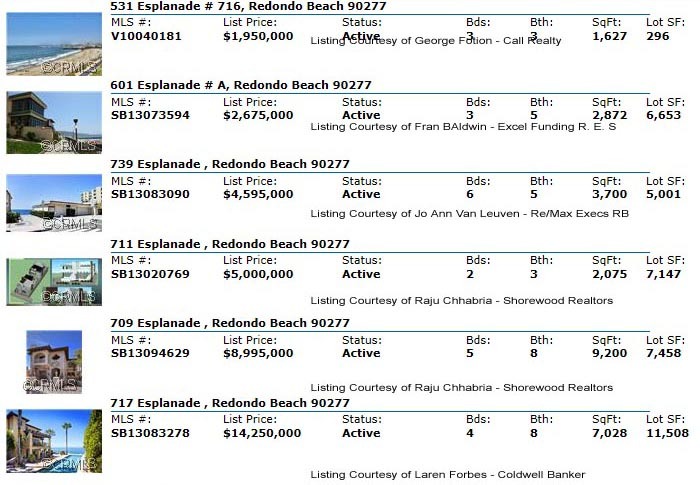 For updated oceanfront homes view the current oceanfront home listings in Redondo Beach.